Yes. It’s real. 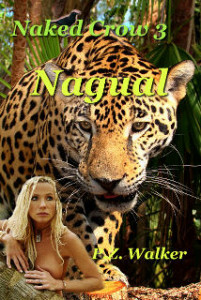 Naked Crow 3, called “Nagual“, is out into the world. The spread to all the shops will take a while but it’ll get there. In the meantime I have a serious question to all the readers (and non-readers). I am working on a fourth Naked Crow book. Are there issues concerning naturism/nudism that you would like to see addressed in a novel on naturism? I’m not going to ‘lead’ you by giving examples to keep things open for everyone. If you feel something needs to be highlighted or in another way addressed, please let me know in a comment or let me know via e-mail. I can’t promise that I’ll be able to deal with everything that’s mentioned but I’m going to do my best. Thank you! Yeah, got this book myself from Amazon.